When you find your breasts full and you’re ready to find relief but you’re without your baby or breast pump in sight, what are you to do? Whether stuck at work or away from your nursing newborn on an emergency, discover five things to do when you’ve forgotten your breast pump, from hand expressing to icing your breasts to avoid engorgement. “The important thing to note is that you don’t need to drain the breast, you need to relieve pressure,” explains Sara Chana, IBCLC, international board-certified lactation consultant, birthing instructor, classical homeopath and herbalist. Express too much milk and your body will produce more, exasperating the problem further. The goal is to find relief when without your breast pump. The most important skill you can gain when breastfeeding, expressing breast milk by hand, takes practice. But it can be a lifesaver when you’re stuck without a breast pump. Chana explains that babies latch in deep and then start to compress, which is the simulation you’re trying to reenact. Milk having trouble letting down? Relax and use a heat compress to encourage milk production. When you’re ready to nurse yet unable to use a breast pump, help reduce pain and swelling from over-full breasts by taking ibuprofen, like Advil. However, you’ll want to check with your doctor on dosage information to ensure you and your breastfeeding baby are given the green light to find relief with this over-the-counter medicine. Take some ice, a cool cloth or chilled cabbage leaf compress to your engorged breasts and express or nurse when you can. “Your body can actually produce breast milk for up to two years after you’ve stopped nursing,” advises Chana. “So the misconception is that your milk will go down if you ice your breasts or skip a breast feeding is not true.” Chilling those beasts — or rather, breasts — when pumping or breastfeeding just isn’t an option. When all else fails, you just my find another sympathetic mother with a willing baby to help you find relief for your full breasts. Regardless of which side of the fence you’re on when it comes to this topic, desperate times just may find you willing to change sides on this breastfeeding matter. >> Would you breastfeed another woman’s baby? “Breast engorgement is something you don’t have to experience,” says Chana. When reaching in your breastfeeding bag of tricks for these five things to do when you’ve forgotten your breast pump, you and your girls won’t have to suffer. 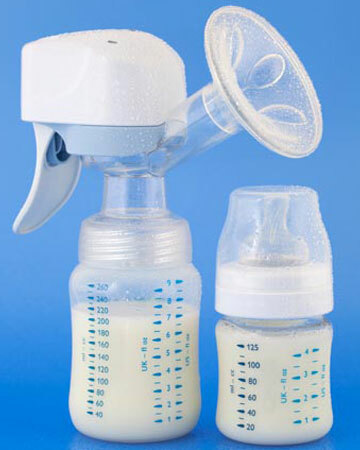 But regardless of whether you’re expressing breast milk away from your babe or using a breast pump at home, it’s important to store expressed breast milk properly if you’re planning to feed it to your baby when not breastfeeding, because any nursing mother will tell you that breast milk is like liquid gold!